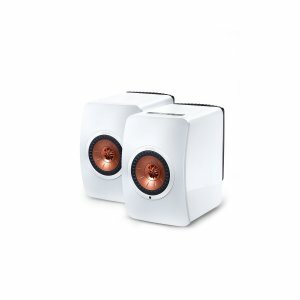 KEF LS50W Powered Music System (white)(pair) [LS50W] - $1,821.60 : New Audio & Video, New Electronics at Lowest Prices! The LS50W Powered Music System is a complete and fully active music system. Sharing the same winning acoustic features of KEF’s renowned LS50, LS50W enables the user to easily enjoy excellent music reproduction, previously only achieved with a system comprised of separate high quality components. Created without compromising on any of LS50's award winning acoustic capabilities, LS50W adds audiophile-grade amplification and sound processing, as well as extensive connectivity. To get the most out of your music, every note should arrive at your ears at exactly the right time. Before KEF perfected our Uni-Q technology, this perfect time alignment could only be experienced in a small 'sweet spot,' leaving listeners outside of the ‘sweet spot’ with a less than ideal listening experience. Uni-Q changed that, opening up the optimum listening space to practically every spot in your room. The LS50W employs an advanced time correcting DSP crossover which takes that awesome achievement to the next level by correcting for inherent time delays introduced in the crossover stage. Amazing sound dispersion matched only by a live music performance is now attainable in virtually every room. This incredible achievement cannot be reproduced by any other active speaker. Every note should hit your ears at exactly the right time. Previously, this perfect time alignment was only a theoretical ideal and perfectly accurate sound could only be experienced within a small 'sweet spot'. With LS50Ws’ advanced time correcting DSP crossover and the unique sound dispersion abilities of Uni-Q, accurate sound reproduction can be achieved in practically every location in any type of room. This is a feat that cannot be reproduced by any other active speaker. The LS50W features an end-to-end 192kHz/24-bit high-resolution digital signal path, a streaming pre-amplifier, and two separate DACs for each channel, for a total of four. Powered in the analogue stage by an incredibly fast and clean 230 Watts per channel in a bi-amp dual mono configuration, the LS50W is a complete, high-fidelity music system that will cost you far less than you’d spend putting together the separate components necessary to match the performance of the LS50W. LS50W gives you all of the connectivity options you’ll need to get the most out of your music, including 2.4GHz/5GHz Dual-band Wi-Fi, Bluetooth 4.0 aptX, Asynchronous USB Type B, TOSLINK Optical, and RCA-type line-level analogue inputs. A dedicated LS50W app (available for iOS and Android) easily facilitates network setup, music streaming, playback and DSP control. An incredible listening experience is easy as plugging in. Simply connect both LS50W speakers to a power source and connect an audio source to enjoy high quality sound that music deserves. Adjust how the LS50W sounds using a selectable EQ tuned to compensate for different mounting scenarios, creating more options for placement and positioning. Regardless of placement, Uni-Q technology disperses sound evenly for total listening enjoyment. Use the touch sensitive control panel or the remote control to ensure complete control of LS50W from a different aspect. A dedicated iOS or Android app can allow detailed adjustment to optimise sound for different rooms.